We have 5,000 years experience in this area… blah blah blah. Need a bit more content here. Need different info and photos for Commercial vs Industrial below. 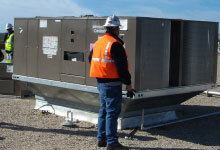 Air handling units (chill water/Multi Zone/DX). Exhaust & makeup air units. Innovative designs to meet energy codes and efficiency standards.